With the Olympics currently unfolding, we are reminded how athletes train very hard for their one chance at nailing a performance to achieve their long-sought goals. I have been undergoing my own intensive training regime for the past several months to earn a Private Pilot Certificate. Like those athletes, I too have been gearing up for the one performance that really counts; in my case that means passing the FAA checkride with a Designated Pilot Examiner who has the authority to grant me the pilot license. That checkride happened earlier today, and I am proud to say I am now a Private Pilot. For me, this achievement is like winning the gold medal, vindicating months of hard work and sacrifice. 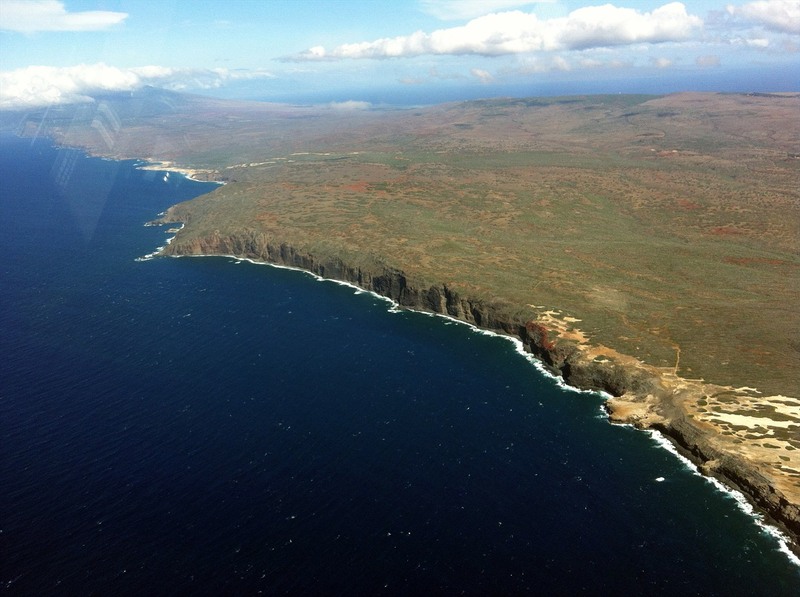 I am grateful to my CFI Scott and the entire staff of Galvin Flight Services Hawaii for their tutelage, but most of all, I thank my wife for her patience throughout this intense training period. Aviation goes back a few generations in my family to my great-grandfather who flew in the Army Air Corps, worked for the FAA, and even rubbed shoulders with Charles Lindbergh. My dad grew up flying with him and became a Private Pilot with an IFR Rating, and as a result aviation was an important part of my upbringing as well. I spent most weekends at the local airport with him helping maintain and fly his planes. Twice I flew with him to the EAA AirVenture Show in Oshkosh, Wisconsin, where we camped for a week under the plane's wing and soaked in the aviation culture. Growing up, my whole family was very active in the local AOPA chapter, where much of our social life centered around general aviation functions like fly-ins at local airports. Flying is a liberating, practical, and technically challenging pastime that I hope to expose my kids to as well so that we can keep the aviation tradition going in my family for generations to come. 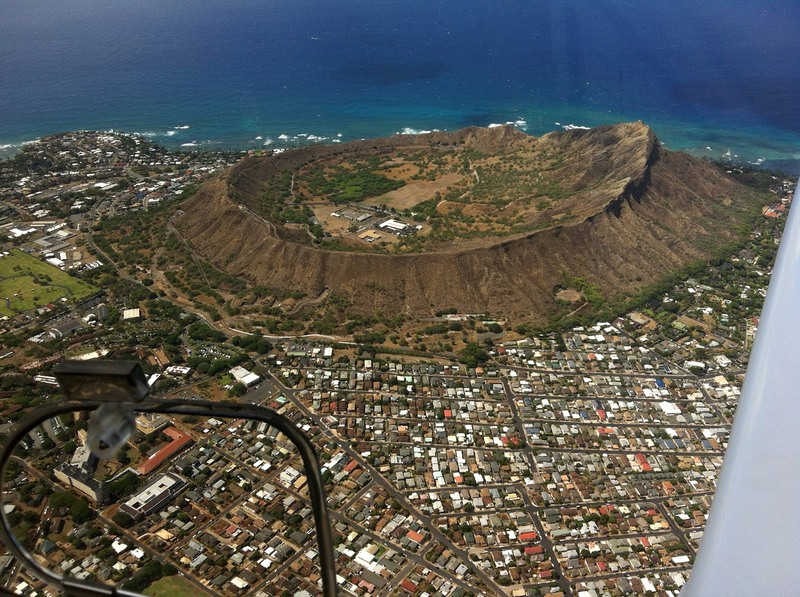 The minimum age requirement to earn one's Private Pilot wings in the U.S. is 17. My original intention was to become a pilot by the time I graduated high school, so at age 15 I started studying a Private Pilot training manual. Since I already had lots of unofficial flying experience with my dad by that point, I was in a good position to become a young pilot. However, by the time I turned 16, instead of putting my energy into aviation training, I decided to move away from home to finish my last two years of high school at a residential math and science focused school instead. That decision was definitely the right one to make for my own education and career, but it had the side effect of delaying my ability to pursue my dream of flight for another 18 years. Watching the cost of flight training skyrocket over the years with increasing fuel prices, I finally decided at the age of 33 that I had put if off long enough. 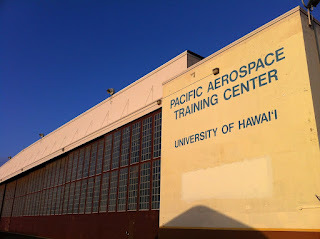 I sought out local flight school options and found the perfect arrangement at the Pacific Aerospace Training Center, which is located just a couple of miles from my home at Kalaeloa Airport (JRF). Not only is the location very convenient for me, but this Part 141 flight school is affiliated with the Honolulu Community College's two-year Commercial Aviation Program, which prepares individuals to become professional commercial pilots. That means, as a student in the program, I earn academic credit and have access to extremely low-cost student loans to help pay for the flight training. The structured regimen provided the necessary momentum I needed to carry me forward. 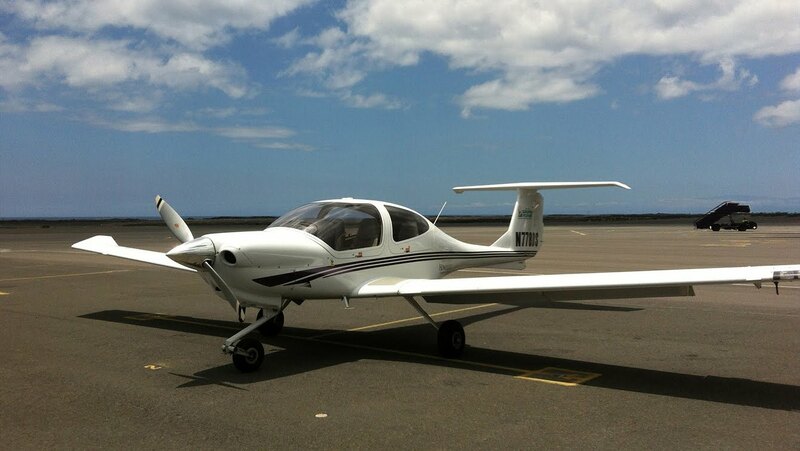 Another nice perk of this school is its trio of Diamond Star DA40 airplanes that Private Pilot students use. The Austrian-made carbon-fiber composite planes have long, slim wings with a large glide ratio about 9:1. 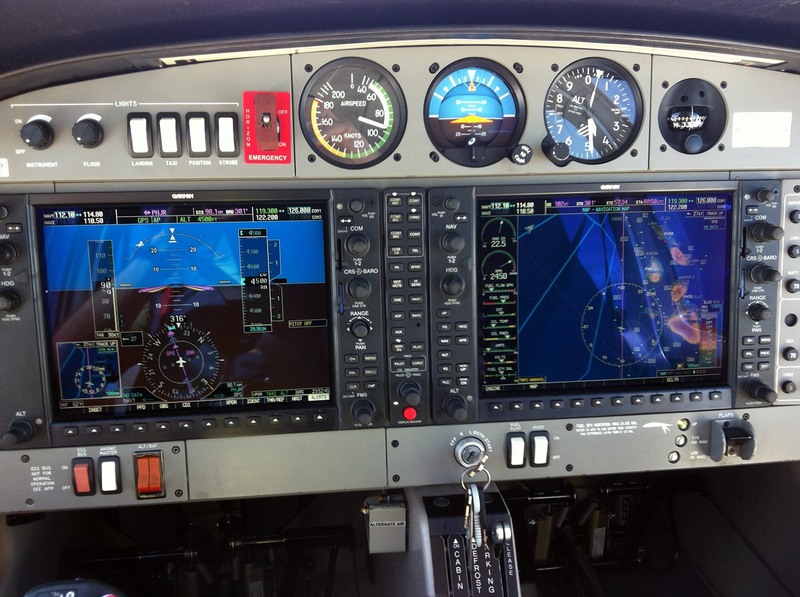 The 180 horsepower fuel-injected engine and constant speed propeller can maintain a maximum speed about 135 knots, and it has the latest avionics built in like the Garmin G1000 "glass cockpit" system. Perhaps its best feature is the bubble Plexiglass canopy, which offers nearly 360 degrees of visibility. The main drawbacks are that this makes the cabin heat up very fast, and sunburns are an ever-present risk. The long wings also make the plane fairly susceptible to turbulence and quite challenging to land. However, the DA40 is one of the most stable and safe training airplanes around, and I feel extremely privileged to have trained on such a modern platform. Before one can fly, one first has to learn the fundamentals of flight. While this can be done through self-study, I found it highly valuable to take a formal ground school course. I enrolled in AVIT 102: Private Pilot Course through Honolulu Community College. Leveraging the engaging Jeppesen Online system, the class met twice per week to reinforce what we learned through the online modules, which ranged from basic aerodynamics, airplane systems, and weather to Federal Aviation Regulations (FARs), human factors, and aeromedicine. Besides imparting the knowledge necessary to safely exercise the privileges and responsibilities of a Private Pilot acting as Pilot in Command of a single-engine airplane, the course's main purpose was preparing students to take the FAA Private Pilot Knowledge Test, which I passed in early June with flying colors. In order to qualify for federal student loans in this program, I had to be at least a half time student, meaning I had to take two courses. Therefore, I also enrolled in AVIT 250: Human Factors and Crew Management, which focused more completely on the psychological, medical, and other CRM factors that affect safety of flight. There are several other good AVIT courses like aviation weather and history to choose from too. About halfway through the semester in mid-March, I had my funding squared away and enough basic knowledge to begin my flight training. I remember clearly the thrill and apprehension I experienced on the first flight when my instructor had me do the takeoffs and landings myself. The best way to learn is by doing, after all. 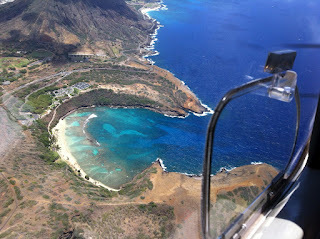 I was ready to solo by the first week of May when I had about 18 hours of flight experience. However, my Stage 1 check ride with the school's chief flight instructor got scrapped when we discovered a bad magneto during the preflight engine runup test. There wasn't time to reschedule the flight right away because I left shortly thereafter bound for Houston for an A4H-related microgravity research campaign. I came back a month later and after a couple of review flights with my instructor, completed my stage check and first solo on June 8 with about 20 hours of time under my belt. Flying by myself for the first time was absolutely exhilarating and terrifying at the same time, but I was well prepared. 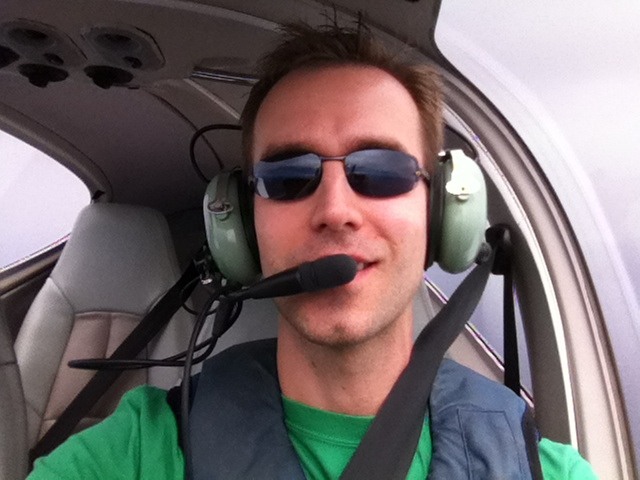 Here's a picture of me after returning safely back to Earth on my first solo flight. 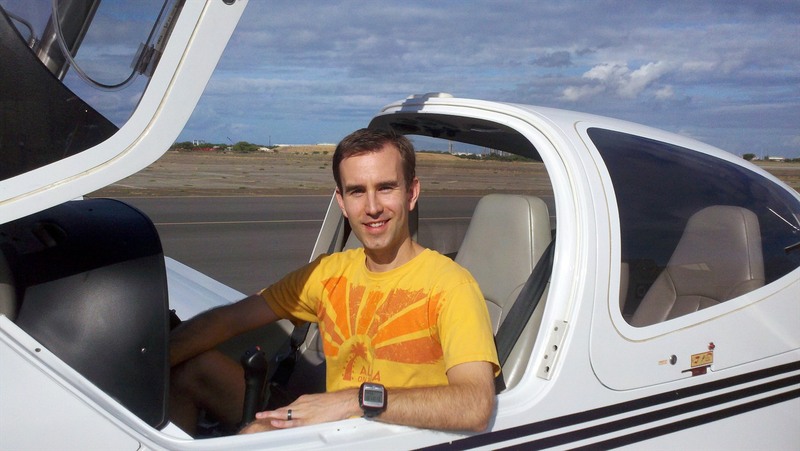 One major purpose of Private Pilot training is to prepare people to be safe cross country pilots. The FAA defines cross country flights as any flight over 50 nautical miles in distance from the originating airport to a different airport. 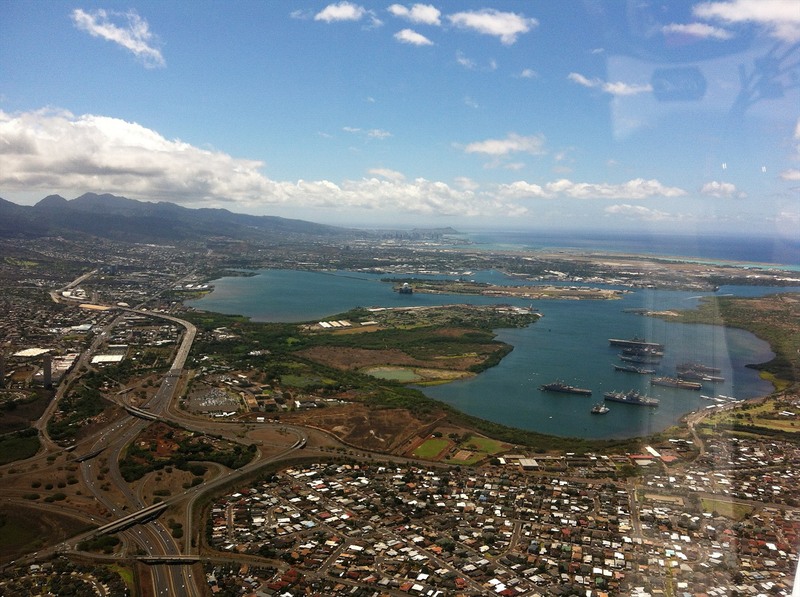 Unlike local flights, one should file a flight plan and must carefully plan cross country flights, taking into account variables like forecasted winds aloft, fuel consumption, and navigation procedures. 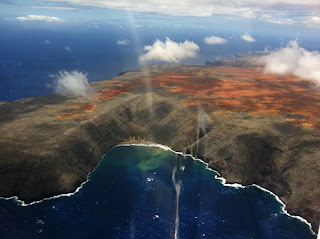 To date, I have finished five cross country flights to different islands in the Hawaiian chain. Three of those flights were solo flights, and one was a night flight. These flights really gave me a chance to enjoy the scenery more as compared with the more task intensive maneuvering practice of local flights. 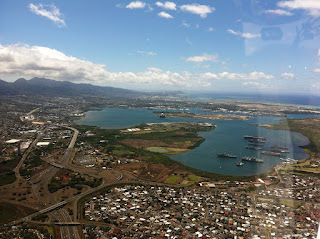 Whenever I could, I would snap photos; some of which are below. If you like these, check out the rest in my Phanfare album. I suppose my primary motivation for wanting to learn to fly is the sense of accomplishment at learning such a challenging skill. Pilots must develop superb situational awareness, multi-tasking, communication, navigational, and analytical skills in order to ensure safe and productive flight. That is why pilot credentials are so relevant for aspiring astronauts as well. Crewmembers on space missions must possess those same qualities to successfully operate complex systems whether they are the spacecraft pilots or not. So what's next for me flying-wise? While I am very tempted to stay in this academic program to earn at least my Instrument Rating, the cost/benefit ratio just isn't favorable right now. Perhaps in the future I will do so. 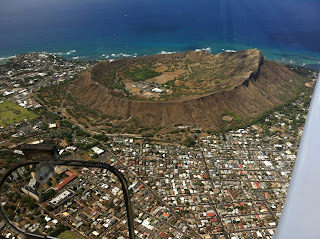 Meanwhile, I plan to fly occasionally to stay current and will gladly take friends and family up for flights over Oahu or to neighbor islands in Hawaii. I may pursue additional glider and/or aerobatic training as my time and funds allow because they are relatively easy and should add a great deal of skills to my repertoire. Most importantly, I will have fun exploring the world of aviation and sharing that sense of adventure with my kids. Thanks Admin for sharing such a useful post, I hope it’s useful to many individuals for who looking a career in the aviation industry and developing their skill. Thank you, Amirtha and Priya! Clear skies! Great story, thanks. 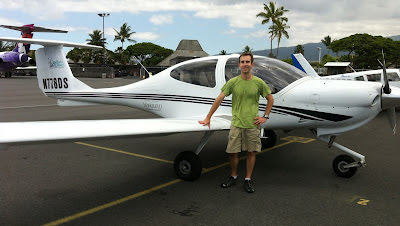 I learned in a Cessna at the University of Wisconsin many years ago when it was considerably cheaper. But flying through the islands must be a really beautiful experience--and probably more interesting than lots of farm land. For the past couple of decades I've been flying gliders in Wisconsin, which indeed are cheaper and give you great stick and rudder skills. I hope you get your add-on rating with them; other than the tow the mechanics isn't that different, and obviously you are up for the headwork. Incidentally if you register at faasafety.gov you can now get a commercial drone pilot's license by passing 1 free written test. Hey, can't hurt!